Too much sugar isn’t just bad for your teeth. It can harm your liver, too. The organ uses one type of sugar, called fructose, to make fat. Too much refined sugar and high-fructose corn syrup causes a fatty buildup that can lead to liver disease. Some studies show that sugar can be as damaging to the liver as alcohol, even if you’re not overweight. It’s one more reason to limit foods with added sugars, such as soda, pastries, and candy. Talk about a sweet tooth. 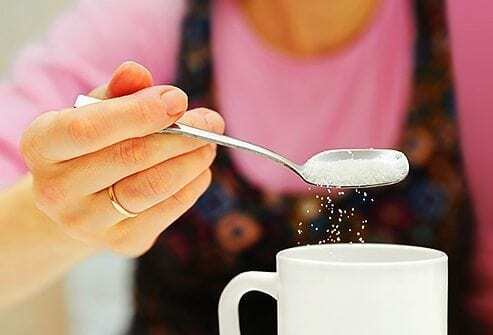 We eat and drink 20 teaspoons — or almost half a cup — of added sugar each day. That’s way more than the American Heart Association recommends: 6 teaspoons per day for women and 9 for men. Our sweets add up: The average American eats about 152 pounds of sugar in just one year. Which of these sweeteners comes from a plant leaf? On food labels, the amount of sugar is listed in grams. What’s 1 gram of sugar? Think about a teaspoon of sugar. That’s what about 4 grams of sugar looks like. A 12-ounce can of regular cola has about 39 grams — or 9 teaspoons — of sugar! Want a low-sugar option? Add only a teaspoon of sugar to iced tea and that’s only 4 grams of sugar. Or drink diet soda or unsweetened tea for zero sugar. Each “ose” – indicates some type of sugar. But sucrose is the sugar found in the greatest concentration in sugarcane (a type of tall grass) and sugar beets (a root). And that’s where our table sugar comes from. Lactose is the natural sugar in milk. Sucralose is an artificial sweetener. Type 1 diabetes is genetic and triggered by unknown causes. Type 2 diabetes is caused by genetics and lifestyle factors, but not sugar specifically. However, being overweight and eating a high-calorie diet — which often includes a lot of added sugar — can raise your risk of developing type 2 diabetes. I am a Certified Natural Health Professional (CNHP) and a Doctor of Naturopathy (ND) (Can). I have been involved full time in Natural Health Alternatives since 2003.